While the small-boat market rides the cyclical waves of the U.S. economy and struggles with high fuel prices, megayacht sales are booming. The 2008 Global Order Book, a compilation of big-boat projects in progress, shows 916 new vessels of more than 80 feet under construction, a 17.9 percent increase from 2007. Experts don’t expect that market to lose steam any time soon. In fact, they say, the number of new megayachts on order is likely underestimated, with many builders, such as the Dutch giant Feadship, reporting only a portion of yachts under construction out of respect and confidentiality for its elite clientele. A growing number of newly wealthy Eastern Europeans and Russians are entering the megayacht market — many as first-time buyers. Observers of the big-boat market say the über rich are always flush with cash and ready to spend it, especially with brokerage megayachts priced to sell with liquidation pressure. While Weller has worked more than 100 boat shows in 35 years, he says the shows represent due diligence and yield mediocre results. Although the Fort Lauderdale International Boat Show is regarded as the megayacht place-to-be, Weller says he has had better luck at Miami, which he says is more brokerage-oriented compared with the Fort Lauderdale show’s new builds. As for new construction, Weller says he just sold a 142-foot Richmond, and the Westport 130s are moving well. Trinity’s order book has taken a dramatic shift to international clients because of the weak dollar and emerging wealth in Eastern Europe and the Middle East. While Americans worry at the pump, the oil exporters have more money than ever, with the price of a barrel soaring to more than $140 this year before falling back in late summer. “Right now we have four boats for Russians and Eastern Europeans and three orders from clients in the Middle East,” says Billy Smith, vice president of Trinity Yachts. Trinity is the nation’s largest custom builder, with 24 yachts under contract — five of which will be on display at the Fort Lauderdale show. “The oil-producing regions of the world are experiencing rapid growth,” he says. Trinity just quoted an international client on a 65-meter boat with a 38-month delivery. New 50-meter vessels of less than 500 international gross tons have a 30-month build estimate. Burger Boats of Manitowoc, Wis., is seeing a tremendous amount of interest in the 40- to 55-meter arena. It has five vessels under construction. New orders, depending upon delivery size, are projected for completion in 2010. Burger just delivered its first Russian “twins” last year, Areti I and II — each 127 feet. International Yacht Collection, a subsidiary of Trinity Yachts, reports its first half of 2008 was its best year ever, according to broker David Nichols. IYC will have 14 yachts from 100 to 165 feet at Fort Lauderdale. “[Boats] 120 feet and above are strongest, especially 150 feet,” says Nichols, contending that those buyers are fairly recession-proof. With many yards three to four years out (even longer for some European yards), Nichols sees European buyers — especially Russians — turning to American yards with shorter lead times. Nichols expects a good Fort Lauderdale show, although he acknowledges there will be many “bottom feeders” looking for deals, while others wait for the presidential election, just days later, before committing to megayachts. Show Management Inc., the show’s producer, expects a strong megayacht presence similar to last year, says spokesperson Andrew Doole. “In this business you’re noticed by your absence, so you can assume all the girls are coming to the prom and will be dressed to kill,” says Mike Joyce, CEO of Hargrave Yachts in Fort Lauderdale. Hargrave will have nine megayachts on display, including its new, 84-foot raised pilothouse. It’s looking for a good show from its 100 percent American clientele, although Joyce concedes he may have to work hard for those sales. With full-time programs under way in Dubai and Europe and its European show debut at Cannes, Hargrave is working with the U.S. Commerce Department on opening up Russia. Palmer Johnson of Sturgeon Bay, Wis., is reaping the benefits of it efforts in Europe, a five-year journey thus far for CEO Mike Kelsey, who keeps racking up frequent flier miles across the pond. Peoria, Ill.-based Caterpillar, one of those engine builders, says it is enjoying tremendous growth. Other megayacht product suppliers, such as Fort Lauderdale-based Palladium Technologies, are looking forward to a good Fort Lauderdale show. 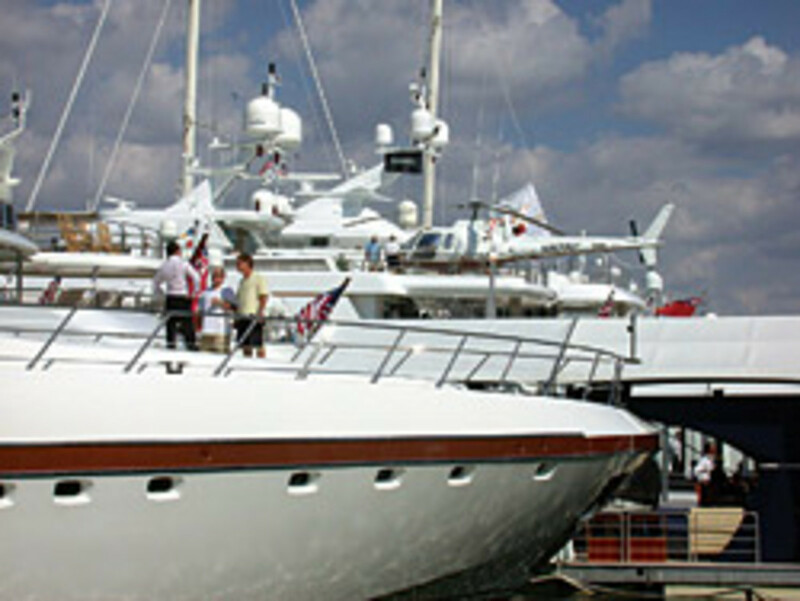 Palladium designs yacht monitoring systems, alarm security software and entertainment systems. Blake says small-vessel brokers will have a tough time at the Fort Lauderdale show, but thinks it will be a great show for the megayacht crowd, barring a hurricane.